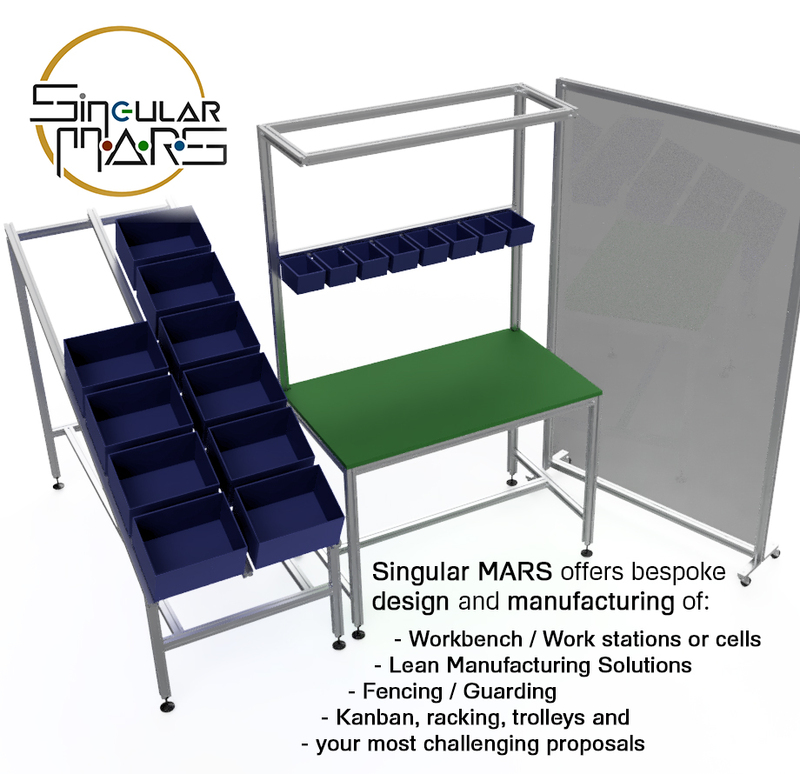 Lean Production Solutions, flow racks, Kanban systems, trolleys, etc. Safety Guarding and fencing with polycarbonate panels or steel mesh. We prefer to use T-slot Aluminium Extrusion over Steel because of the superior versatility and flexibility (T-slots provide easy adjustments), cleanliness (anodized aluminium – requires no painting) and modularity of aluminium. In addition, it’s lighter, easy to work with and easy to recycle (you can sell it back to us after its useful life). Bespoke solution for the specific, special purpose of your application. Delivered fully assembled or flat-pack semi-assembled with instructions. Get in touch with us and let us know your particular problem. Give us as much information as you can (dimensions, application, desired features, sketches…) and we’ll provide a quote. Based in Surrey, we can deliver to Sussex, Kent or any part of the South East of England and the rest of the UK. Be it just the design, only the manufacturing according to your plans, or both services, do not hesitate to contact us to get quality industrial furniture for your factory needs.